No matter how much of an effort I make to spend time with my kids outside during the heat of the summer, sometimes my internal thermometer begs for some indoor activities. North Carolina is hot, y’all. I know there’s a heat wave all over the country right now, but the South is known for it’s brutal summers and thick humidity. Air conditioning is my friend. My heat intolerance isn’t problem for Christopher, who is old enough to ride his bike outside with his friends even when I’ve had enough for the day. But for His Majesty, it can sometimes take a little creativity to keep him busy,and adequately distracted from the things he wants to do outside. 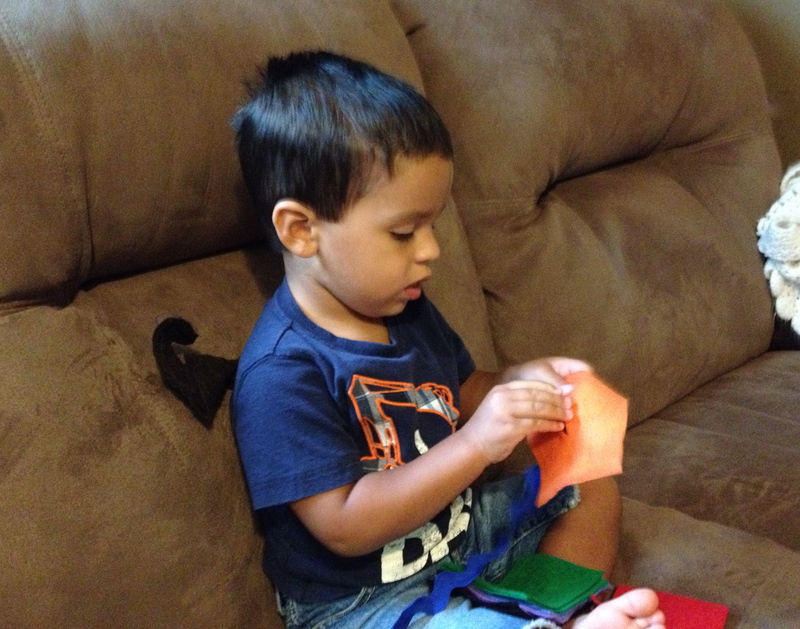 If you have the same dilemma with your own toddler, allow me to suggest two ideas that have made our indoor time simple, quiet, and enjoyable. The first idea is playing with dried beans. 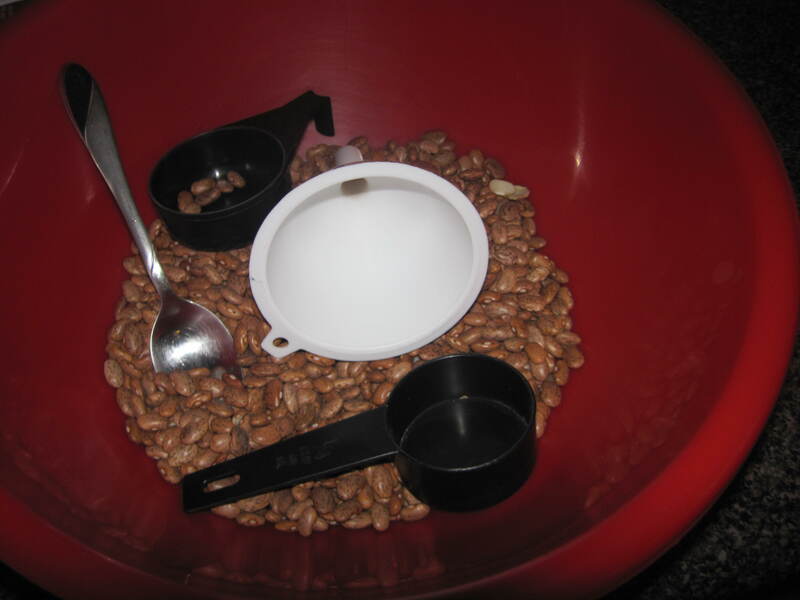 All you need is some dried beans, a kitchen funnel, a few measuring cups, bowls or containers in various sizes(empty yogurt cups, spice jars, or oatmeal containers will work great for this), and spoons. You can make an easy funnel by cutting off the top of a plastic pop bottle if you don’t have one. 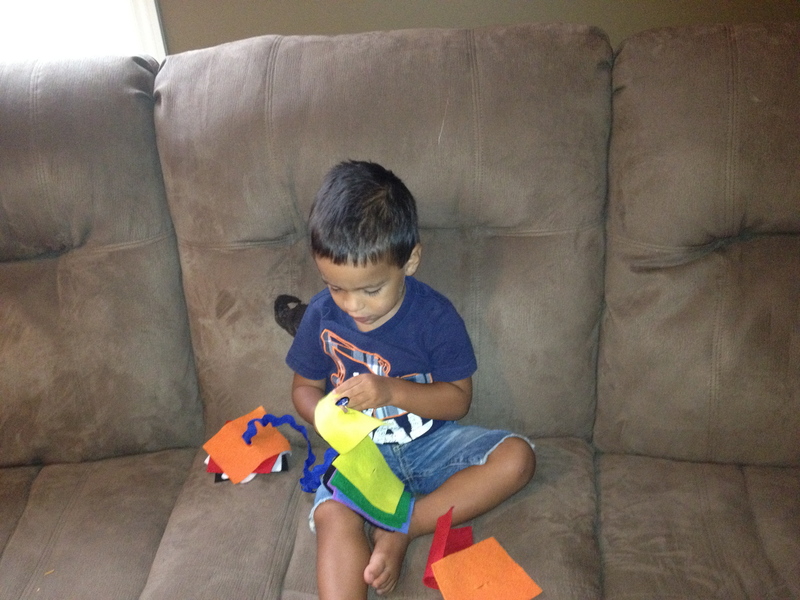 His Majesty has enjoyed this activity since he was about 18 months old. It’s a bit messy, but I just vacuum after he’s done, and all is well. 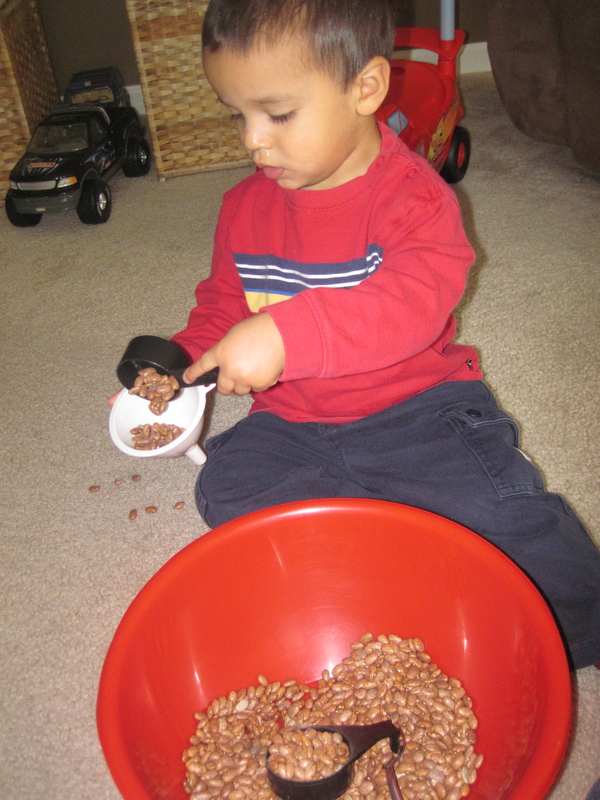 He loves pouring and scooping the beans. 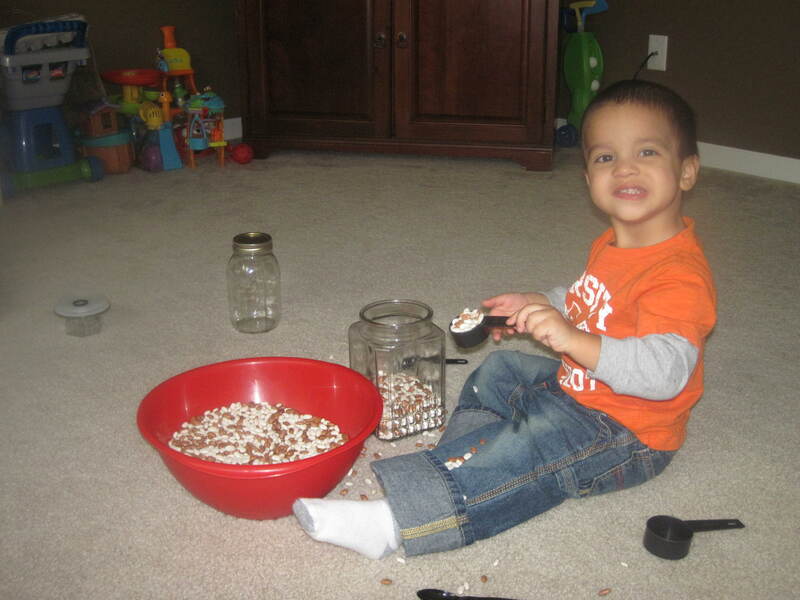 When your child is ready, you can make clean up a sorting activity, and sort the different beans into similar groups. You can count them. 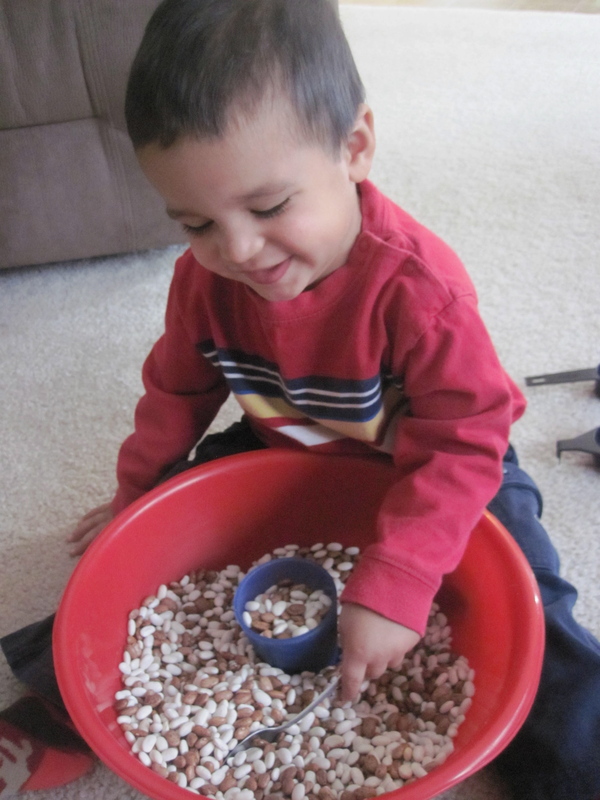 You can also hide little toys (he likes when I hide little people in the beans) and have your child can dig for them, like a little sensory scavenger hunt. His Majesty has never been the type of kid who mouths things, so I don’t really worry about him choking on these. 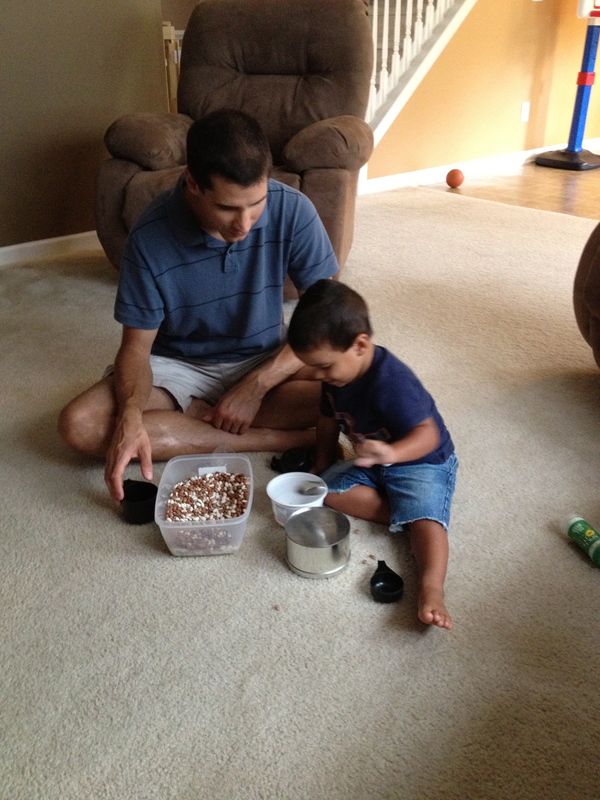 Plus, if he decided to eat a few (which hasn’t been a problem thus far), beans are obviously edible, so no worries there. However, you should also be aware that some kids will stick things in their ears or nostrils, so keep an eye out if your kid is into that. When we’re done playing with these, I put them back in a container in the pantry and they’re ready to play with the next time. I don’t cook dried beans (I honesty don’t know how, but I do know that doing so takes a long time, so I don’t really care to learn either), so I don’t have to worry that they’ll accidentally end up served for dinner after laying on the carpet or being handled by sweaty toddler hands. 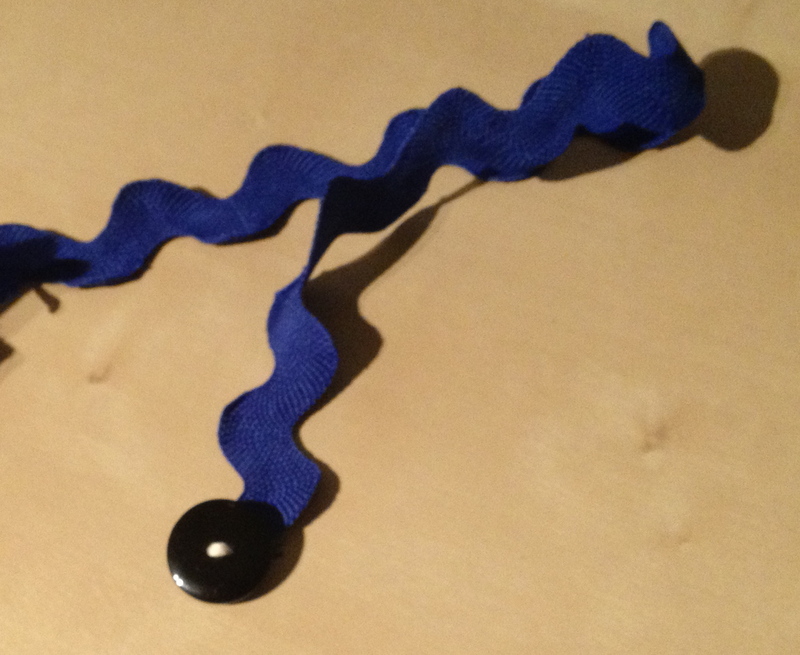 Another fun, and very easy, busy toddler activity is a button snake, like this one from The Activity Mom. 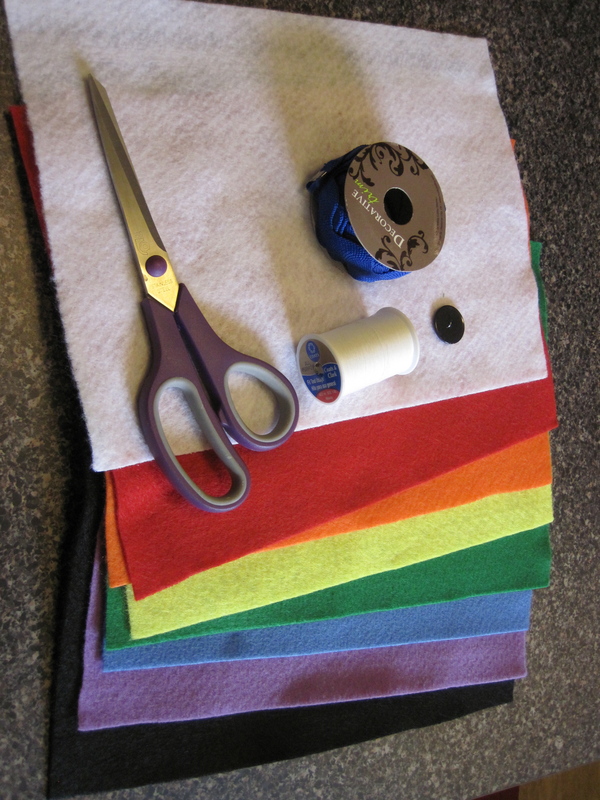 All you need for this is some very basic sewing skills, a button, some ribbon or fabric trim, and felt squares in assorted colors. I also used an elastic hair band, but that it totally optional, and I’ll tell you about that in a moment. 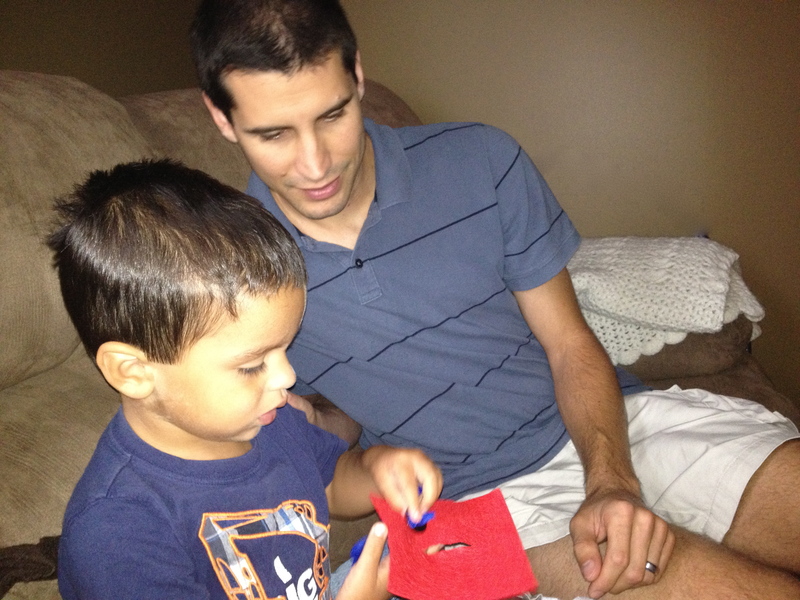 Start by cutting your felt into shapes that you want your toddler to “feed” the button snake. I used squares, just because it was the easiest, but you could use triangles, stars, circles, hearts, or a combination of shapes. 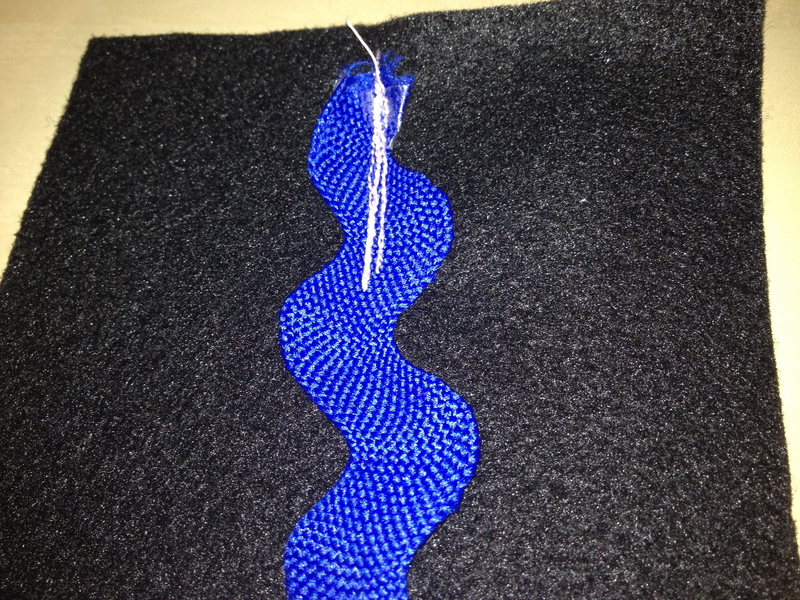 Set one shape to the side to serve as the base of your button snake. In the center of all of your shapes except for the one you reserved, cut a slit long enough for your button to fit through. Those will be your button holes. Take the one felt shake that you set aside and sew your ribbon (I used a squiggly trim, since it was a bit firmer) to it. I made a few passes with my sewing machine, and I didn’t even change the thread color, I just used the pink that was already in there. Make sure you sew it on there securely, since your toddler is going to pull on the ribbon, and you want this to stay together so that the rest of the shapes don’t slip off the ribbon. 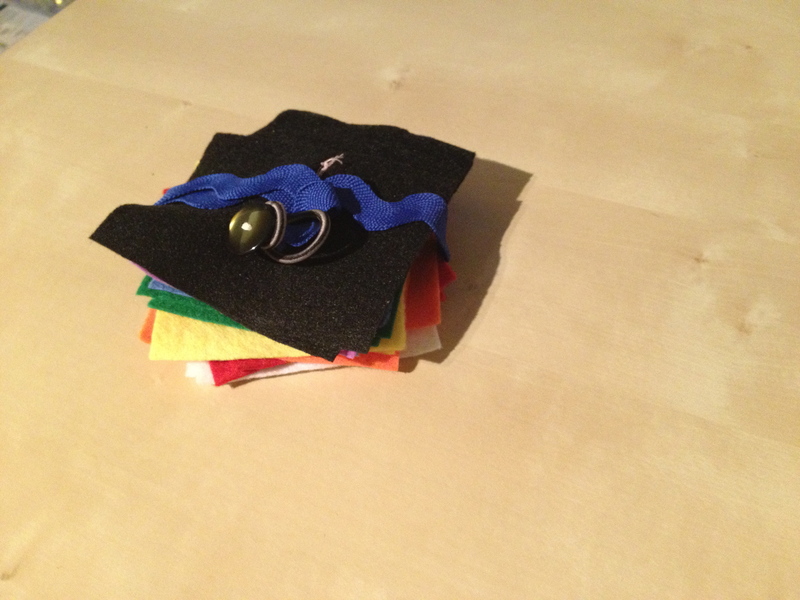 The next step is to sew your button on the other end of your ribbon. 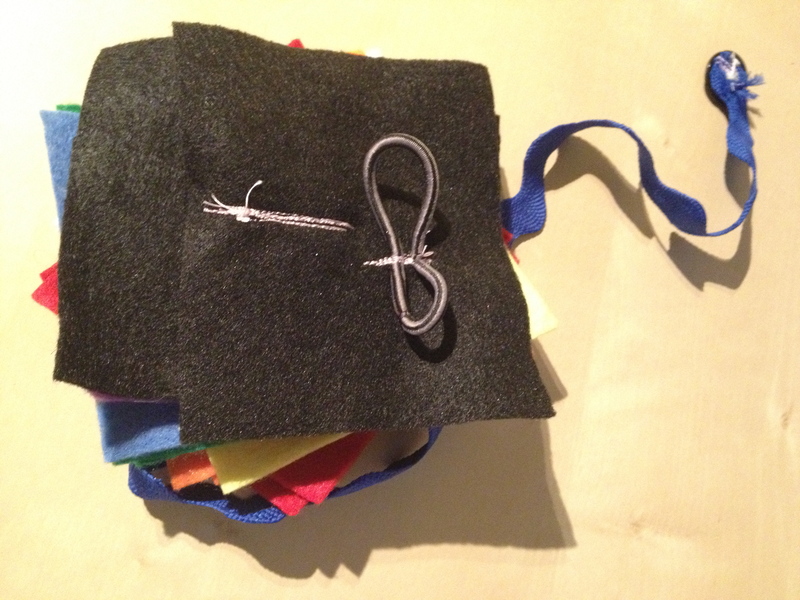 I hand sewed it flush with the ribbon, and I did about 40 passes, to make sure it was good and sturdy. Toddlers are rough, after all. Here’s where an elastic hair band came into the picture. 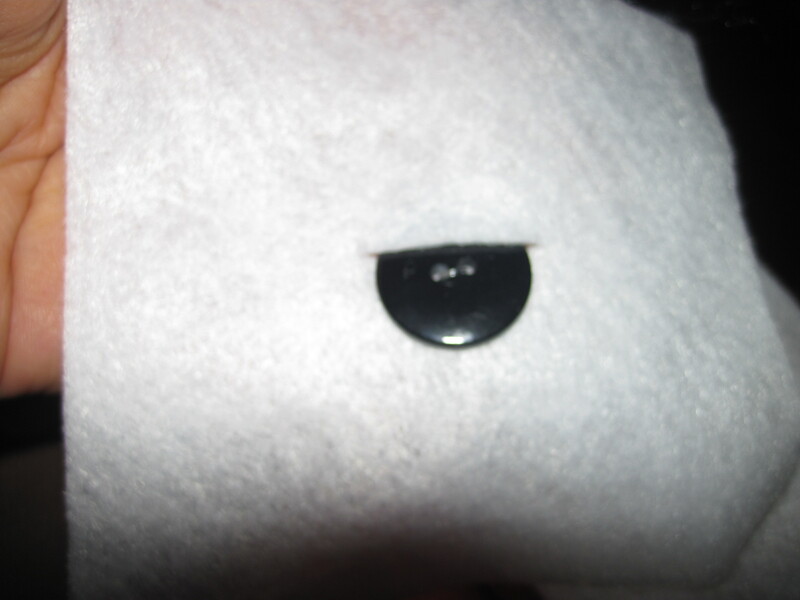 I sewed the hair band to the underside of the felt base. I sewed right down the middle of the band, giving me two loops. That makes it easy to wrap everything up and keep it together for storage. That’s it. Your button snake is ready to rock. Hand it to your toddler and let him or her “feed” the button snake. The monkey tail you see peeking out from behind him is totally optional. He got that at his Best Friend’s monkey themed birthday bash, and he has made it part of his daily wardrobe now. The button snake is quiet and portable enough to bring to the doctor’s office, or on car trips, making it a great addition to a busy bag. 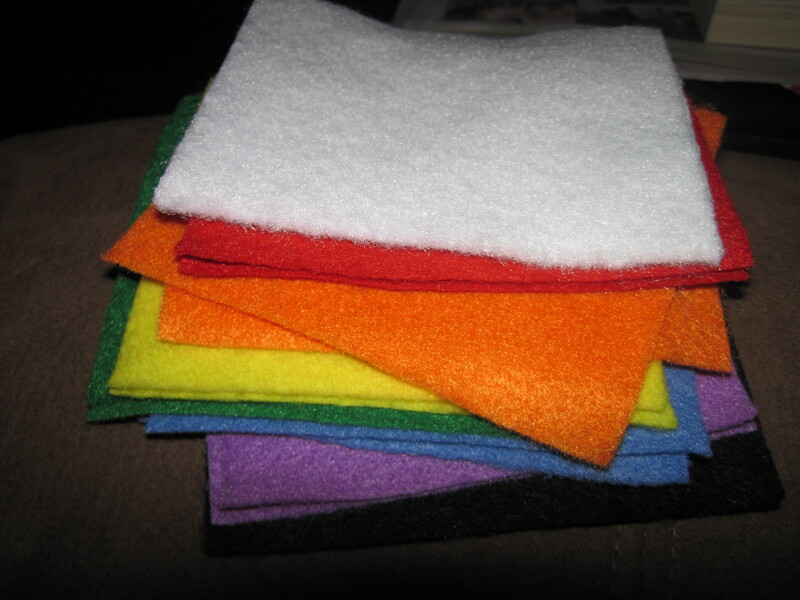 You can also reinforce color recognition into this activity, and, if you cut your felt into different shapes, you can extend the activity to include shape recognition. As a perk, there’s little, if any, clean up involved when the fun is over. Having simple little activities like this on hand has been really useful if I need a few minutes to make a phone call, or to assemble lunch or to just have a few moments of quiet. 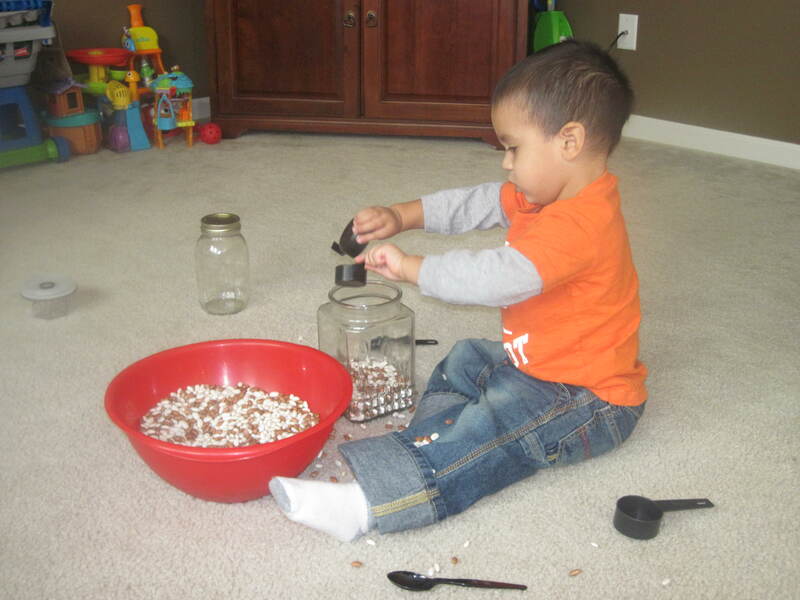 Plus, they are great for fine motor development. What have you been doing to keep yourself or your children busy this summer? I’d love some new ideas if you care to share!